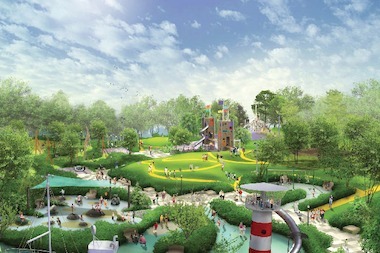 A rendering of the "Play Pyramid" at Maggie Daley Park. CHICAGO — MB Real Estate was awarded a management contract Wednesday for the soon-to-open Maggie Daley Park by the Chicago Park District's Board of Commissioners. The firm was one of four contenders to respond to the Park District's call for proposals to manage the $55 million park named for Chicago's former first lady, which is set to open this spring. "This was a highly competitive [Request for Proposals] process," said Raffi Sarrafian, the Park District's director of purchasing. "We had four proposals, all were from firms that were recognizable." MB, which also manages Millennium Park, was chosen in part because the firm "guarantee[d] the revenue up to their management fee, which is $180,000 annually for the five-year initial term, with extension options up to $190,000," Sarrafian said. Members of the Park District board pointed out that the estimated annual revenue for the park exceeds that figure, with projections that the park could bring in up to $1.2 million per year. "The committee felt this is the firm best set to get us to that figure," Sarrafian said.